Dean Winchester (to Cas): I swear, if he did something to her, if she is… Then you’re dead to me. 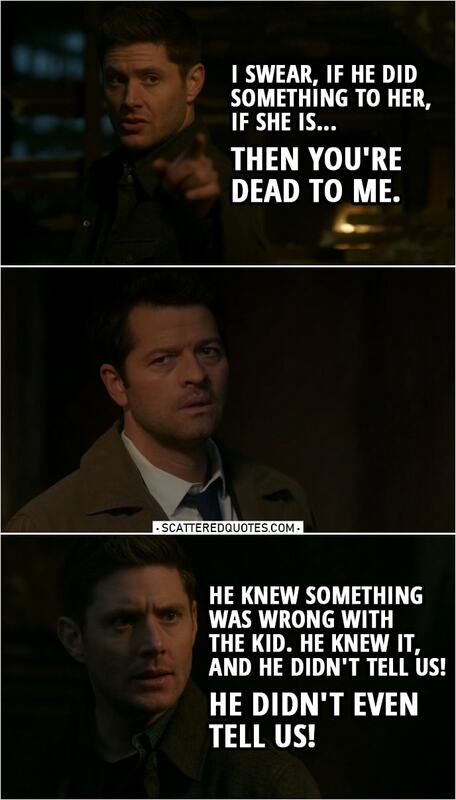 Dean Winchester: No, he knew. He knew something was wrong with the kid. He knew it, and he didn’t tell us! He didn’t even tell us! Castiel: I was scared. I believed in Jack for so long, I… I believed that he was… He was good. I… I knew that he would be good for the world. And he was good for us. My faith in him, it… it never wavered, and then I-I saw what he did. It wasn’t malice. It wasn’t evil. It was like Jack saw a problem, and in his mind, he just solved it with that snake. What he did wasn’t bad. It was the absence of good. And I saw that in him. But we were a family, and I didn’t want to lose that, so I thought I could… fix it on my own. Felt like it was my responsibility.